Dungarvan’s Town Hall Theatre Sunday April 30th and Monday May 1st 8pm each night. There is great excitement about Superstarz the new musical extravaganza. Superstarz is a musical play written by Ógie Ó Céilleachair from An Rinn with Cyril Stack the renowned musician & composer from Cappagh, rowing in on the original compositions. All proceeds from Sunday’s performance will go to the RNLI Helvick Lifeboat Station while Monday night will benefit the Southern Branch of the Cystic Fibrosis Foundation. 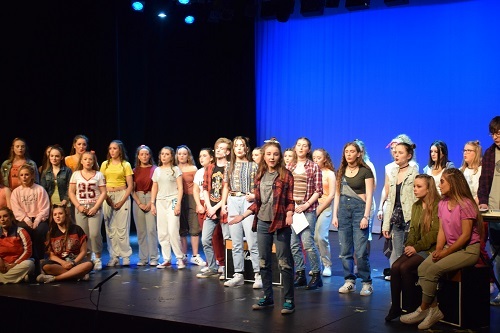 The play was first performed to great acclaim in March by students Ó Céilleachair’s Transition Year drama group in Gaelcholáiste Luiminigh, Limerick City. Two casts of 25 took to the stage each night with a group of 15 dancers. Afterwards the students indicated that they would like to take the show on the road in benefit of charity. What better place to take it to than Dungarvan, their drama teacher’s home town! Superstarz is set in the Britpop influenced 90’s. A group of disadvantaged teenagers have been given the opportunity to attend a prestigious performing arts institute called ‘Superstarz’. The regular fee-paying students don’t take too kindly to this and are sidelined by the grumpy Mr. Henson. Along the way there is bitter rivalry, a blossoming romance and some funky dance moves. There can only be one winner! For one band, it’s their time to be discovered, to shine and become Superstarz! Tickets priced €10 are available in Kelly’s Pharmacy, Abbeyside and in The Barber Shop, 2 Grattan Sq., Dungarvan. This entry was posted on April 27, 2017 by waterfordarts in General, Performance, theatre and tagged Cystic Fibrosis, Dungarvan Town Hall Theatre, Extravaganza Musical, Helvick Lifeboat Station.